Black basalt on the beach, northern Mauritius, March 2014. First of all, my apologies for the long absence from blogging. Work has been extremely busy this year, and for the last 6 weeks I was in the field with very spotty satellite internet connection. However, I’m back in Cape Town now, and September should be a quieter month for me, workwise. So, I’m hopeful that I will have time to catch up on some blogging. One of the things that I want to blog about is my recent (well, back in March, but fairly recent…) vacation to the beautiful Mauritius, a young volcanic island in the Indian Ocean that is perhaps most famous for having been home to the Dodo bird… before the Dodo went extinct, of course! I have quite a few pictures and stories to share from my trip to Mauritius. For today, I’ll start with a picture of a beach in Grand Gaube in northern Mauritius. My husband and I stayed at a small beachside resort in Grand Gaube, and we explored the coastline near the resort by foot and by kayak. 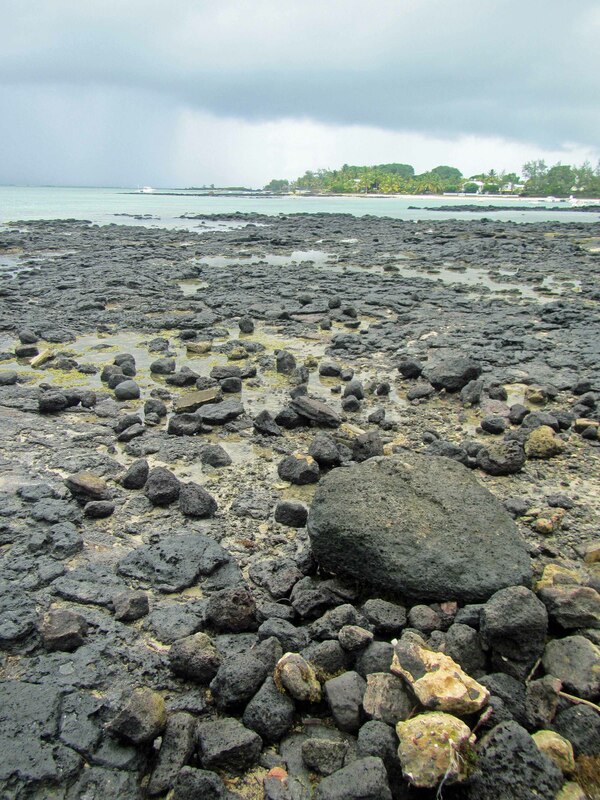 Because Mauritius is a young volcanic island, black basaltic rocks can be seen at many places along the coast. For example, outcrops and boulders of basalt can be seen in the above picture. I noticed that many items around the town of Grand Gaube were constructed out of basalt, no doubt locally sourced. I’ll share some more pictures from Mauritius soon… stay tuned!